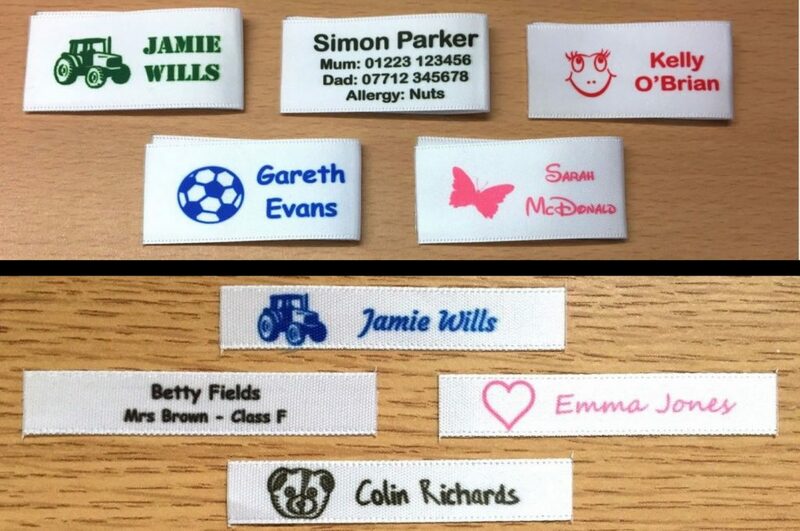 We produce thousands of name labels for clothes for customers in the UK and worldwide, our name labels come in a variety of sizes and can be highly personalised thanks to a bespoke process we have developed which isn’t something many sellers can offer. Whether you’re looking for a simple name printed in black or would like the choice of 10+ fonts, 20+ solid print colours and 50+ optional motifs to create a truly personalised name label for your clothes then you may want to consider us instead. We can also print in full colour, each label is cut and sealed to prevent fraying and for your convenience. Our clothes name labels are also fade free, vivid and longer lasting compared to other simliar products, our fade free guarantee comes from extensive testing which includes washing in both bio and non-bio washing detergent, very hot washing temperatures 100c+ and even soaking them in concentrated bleach with no adverse effects. All of our name labels are manufactured at our Cambridge UK production facility using the aforementioned bespoke process, if you require a custom label we can work with you and will send you a preview before manufacturing begins. When it comes to placing an order, there are a couple of options available including our website and eBay and all you need to do is select your personalisation options or just let us know and we will do the rest. Your order is then safely and securely packaged and shipped via a prompt shipping service to ensure they arrive quickly.